The West Lakes Aquatics Centre offers activities and lessons in Kayaking, Canoeing, Sailing, Windsurfing, Canoeing, Double Skis, General Aquatics, Snorkeling. 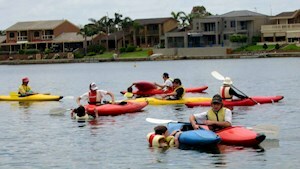 The Lakes are an ideal location for learning and developing skills in water sports. Take the family down for a day and enjoy the programs on offer to boost water awareness or learn new water sports. West Lakes is only 20 minutes from Adelaide’s CBD and with its calmer waters, it’s a perfect place to learn and relax by the water’s edge. Adelaide beaches are calm and perfect for activities such as Stand Up Paddle Boarding. Great core strength, balance and coordination. 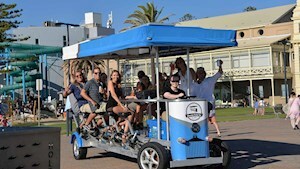 The Glenelg pedal bar provides two hours of fun along the picturesque coastal strip of Glenelg and adjacent roads and walking tracks. Up to 16 passengers. 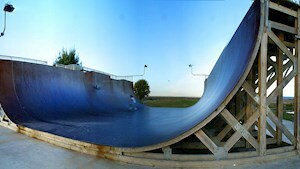 You will find a great atmosphere at West Beach Skate Park every night of the week. It’s the place to go in Adelaide if you are in for some thrills with your skateboard or bike. 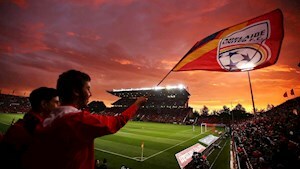 Home of the legendary Adelaide United A-League Soccer team, Coopers Stadium is a world-class facility just 5 minutes from central Adelaide. How about a game of professional basketball? 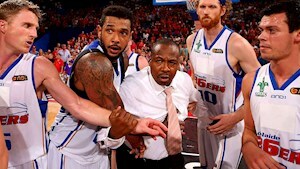 Our very own National basketball team, the Adelaide 36ers, play their hardest at the Titanium Security Arena. Feel like a challenge? 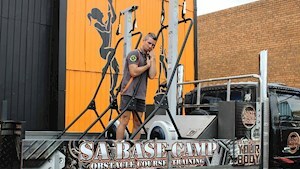 Far from a standard gym, SA Base Camp has massive vertical rope climbs and wind tunnel that generate winds of 80-100 km/hour to run through! 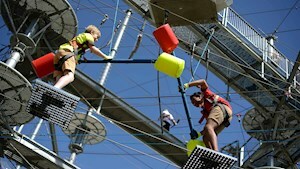 Mega Adventure Park at Adelaide Shores is adventurous fun for all ages and all fitness levels. 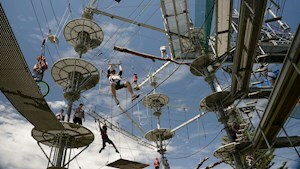 There are three main activities to challenge and thrill you! The IceArenA is South Australia’s premier ice skating facility located just minutes from the Adelaide CBD. Open seven days a week, a great way to cool off on a hot day. 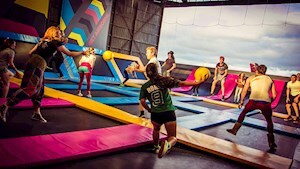 The free-jumping revolution is taking place at Adelaide’s massive indoor trampoline park! BOUNCE in Marleston, about 10 minutes from the Adelaide CBD. Pumpt is Adelaide’s indoor ride park. Indoor BMX, mountain bike, scooter and skate park all in one facility! Great for all weather, for fun, to train, to meet friends. Adelaide has plenty of adventurous fun for both singles and families. From kiddies to big boys and girls, the thrill is up to you! We offer free services for tour and accommodation bookings and provide maps, brochures and great local information about where to eat, things to do and where to go shopping.